Community Safety Call for TDOR 2018! Read more about Community Safety Call for TDOR 2018! Volunteer Call for TDOR 2018! Read more about Volunteer Call for TDOR 2018! The Audre Lorde Project and TransJustice will present Transgender Day of Remembrance 2018, taking place at St. John’s Lutheran Church on Monday, November 19, 2018 from 6pm to 9pm, and featuring conversations and performances in memoriam of those who have passed, but are not forgotten, in our communities. In our current political climate, it is more important than ever to honor the work and resilient legacies of community members who fought, and are fighting, tirelessly for self-determination and survival in the face of overbearing violence and structural oppression. On this day, we confront erasure by honoring their work and lives. Every Fall, the season itself reminds us that change is constant and inevitable. On this note, let’s reflect on the fortifying events, workshops, conversations, and long-time community rituals The Audre Lorde Project has held over the past several months. 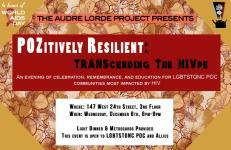 Whether it’s celebrating our 20th Annual Chillin’ & Grillin’ along with BedStuy Pride, serving empowering movement building workshops, guiding folks toward community wellness and healing rituals, organizing the Annual Trans Day of Action, or convening members around immediate issues impacting our communities, The Audre Lorde Project has been showing up! This season, we have a few new team members to welcome on board, fantastic learning opportunities and gatherings ahead, and as always, we want to honor our dedicated staff, volunteers, and movement ancestors for making the work we do possible. On behalf of all of the staff and board of The Audre Lorde Project, we are happy and proud to announce the promotion of Cleopatra Acquaye-Reynolds (Cleopatra from the Bronx) from Membership Coordinator to Program Director. Read more about Exciting News at ALP! The Fifth Annual POZitively Resiilent is a community building night of entertainment, education, and mind-blowing realizations of the world we live in centering communities most impacted by HIV. ALP’s Annual Interpreter Training is a part of a larger vision of Language Justice in Lesbian, Gay, Bisexual, Two Spirit, Trans and Gender Non-Conforming (LGBTSTGNC) Immigrant of Color communities. Trans and Gender Non-Conforming People Are Not Jokes! The Breakfast Club is sending a strong message to its listeners: Trans lives are jokes and disposable. Read more about Trans and Gender Non-Conforming People Are Not Jokes!